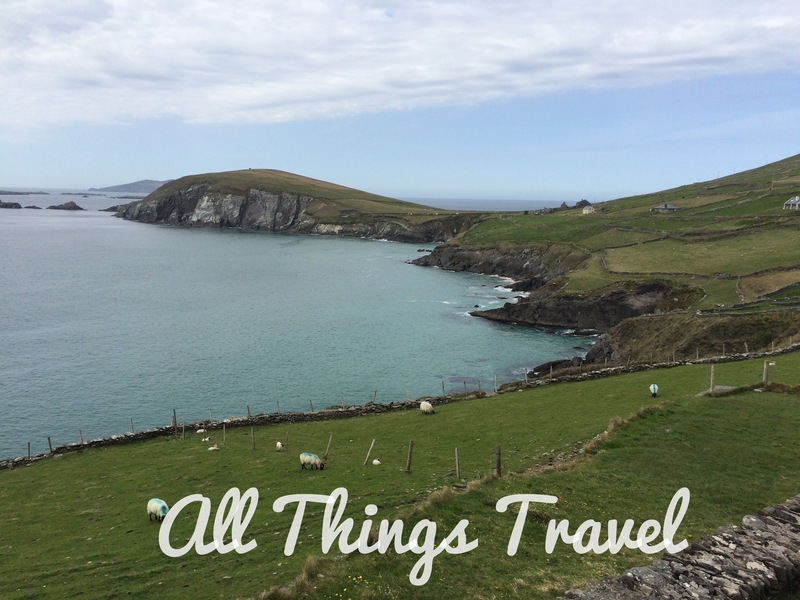 If you, like me, fell in love with the Dingle Peninsula when you saw the movie, Leap Year, with Amy Adams, I have a bit of bad news for you. None of it was filmed there. 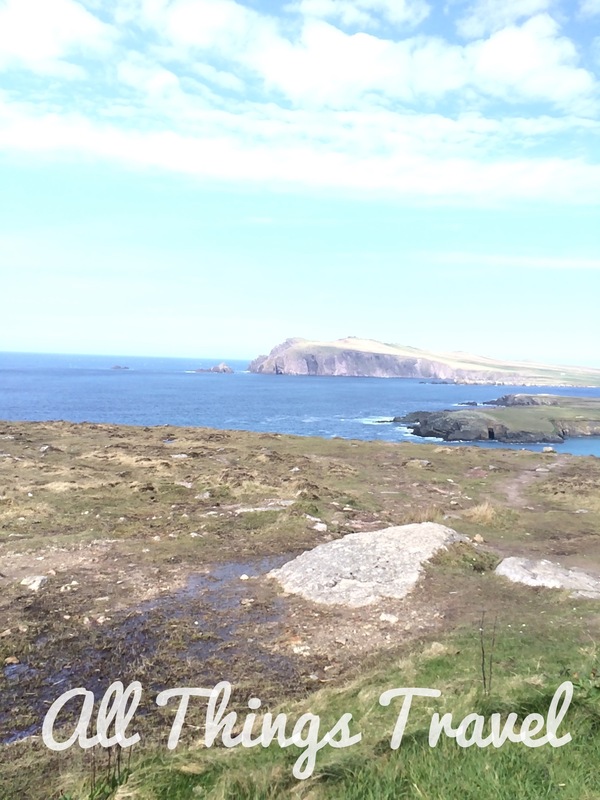 If you’re old enough to have seen Ryan’s Daughter from 1970, however, it was filmed on the Dingle and today many of the movie locations are still identified with signs. 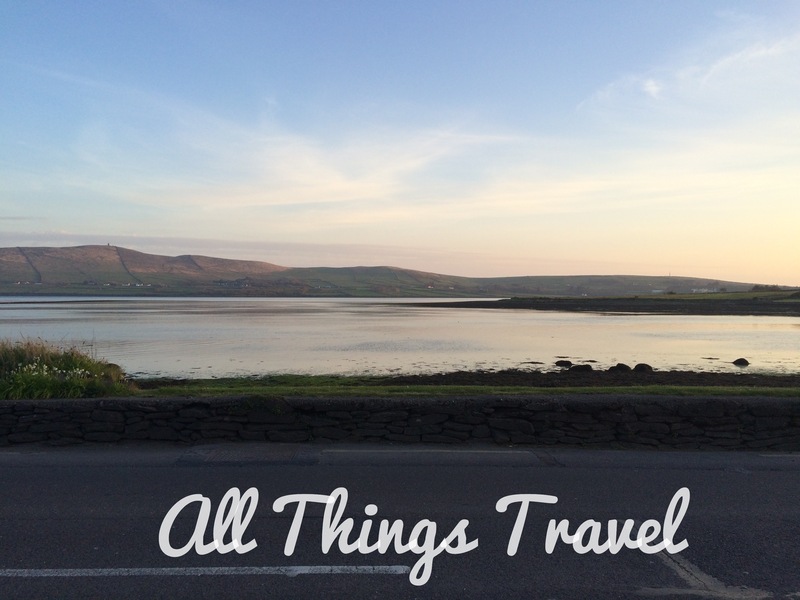 Regardless of the movie representations, the Dingle Peninsula is incredibly beautiful. 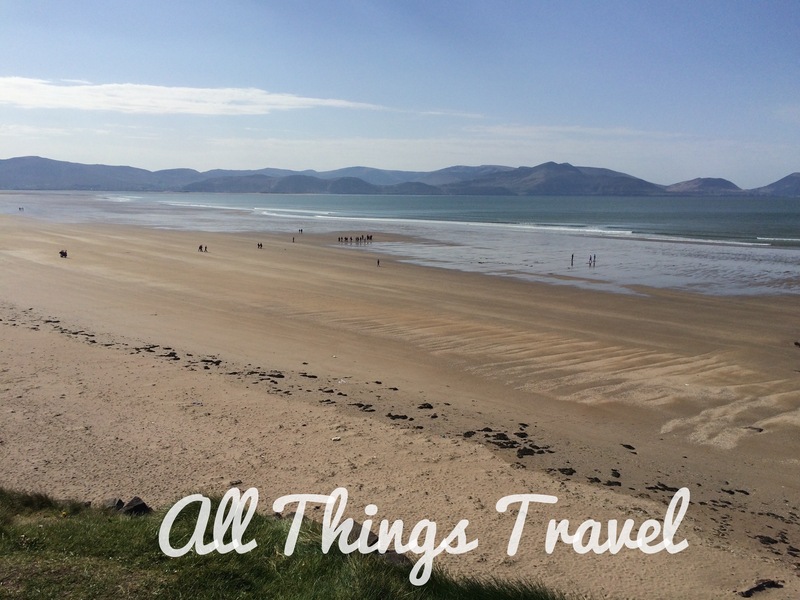 Our first stop on the peninsula was Inch Beach. I’m not sure why it’s called Inch Beach because I think a better name would be Mile Beach. 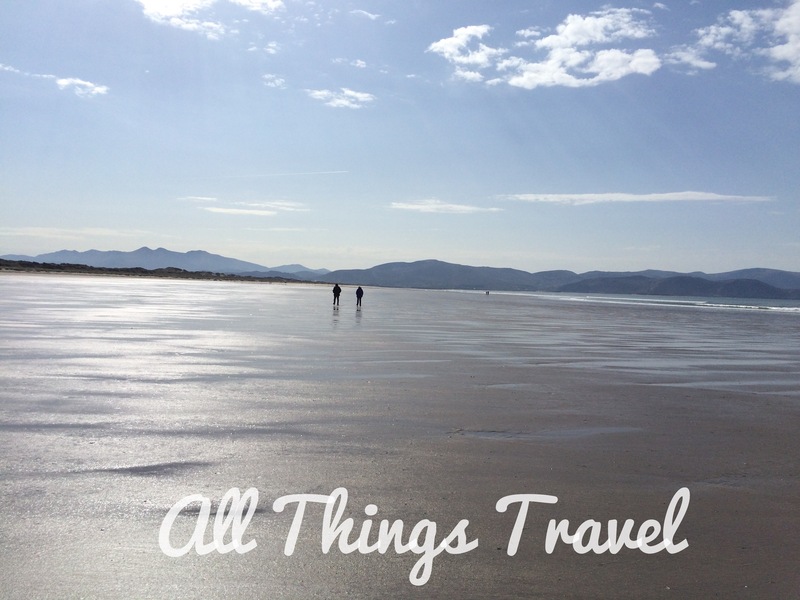 It’s about the widest beach I’ve seen and the views across Dingle Bay to McGillicuddy’s Reeks are spectacular. 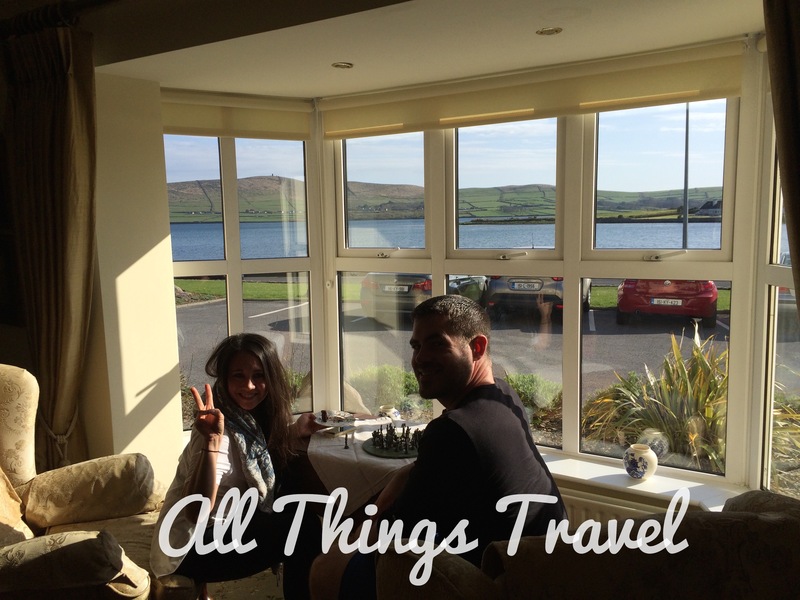 Then it was on to the town of Dingle to find our B&B for that evening, Heaton’s Guest House. 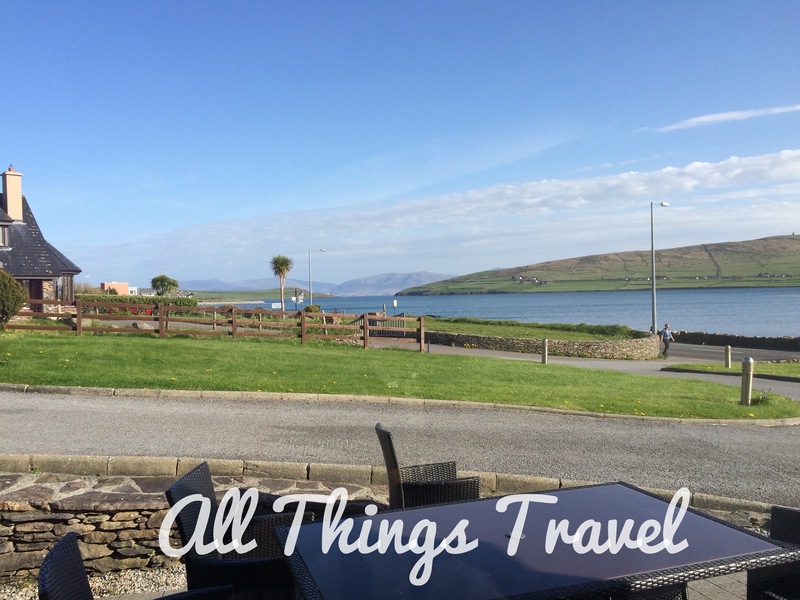 I found Heaton’s on the internet when searching Dingle accommodations and chose it based on reviews, price, and location. We arrived before noon and our rooms weren’t ready that early so we parked the car there and walked about a mile (1.6 km) to the center of town to explore. 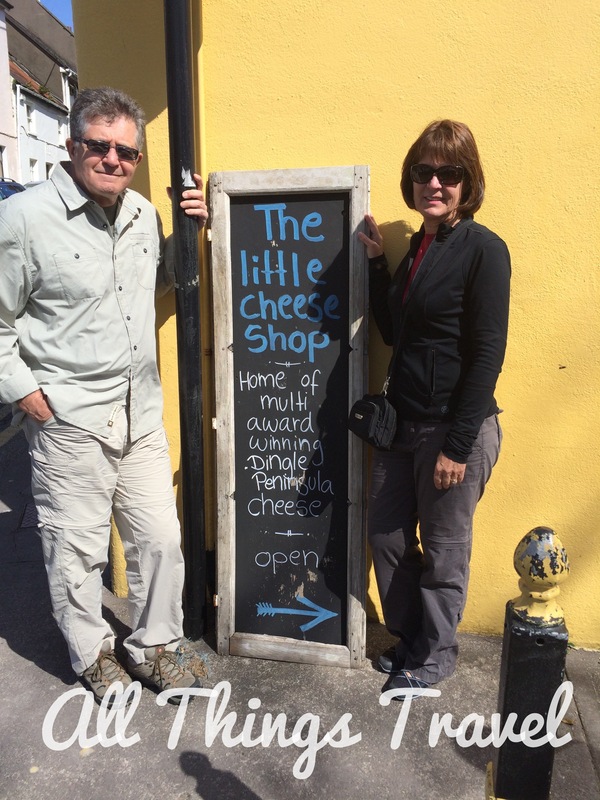 I had read about the Little Cheese Shop in Dingle and we were keen to check it out. 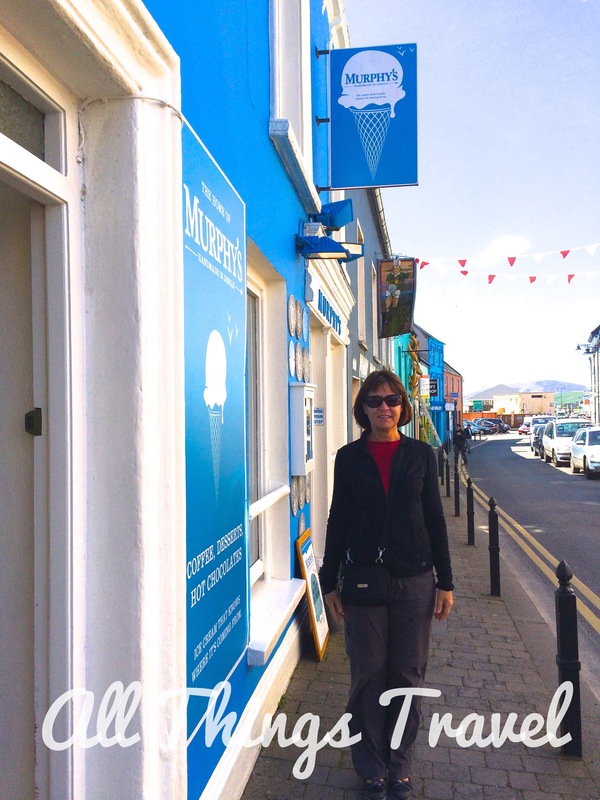 A locked door greeted us with a note that said, “Back in 15 minutes.” We should have known right then but we waited about 30 minutes before finally heading off to check out the other recommendation in Dingle— ice cream at Murphy’s. Fortunately, Murphy’s didn’t disappoint. 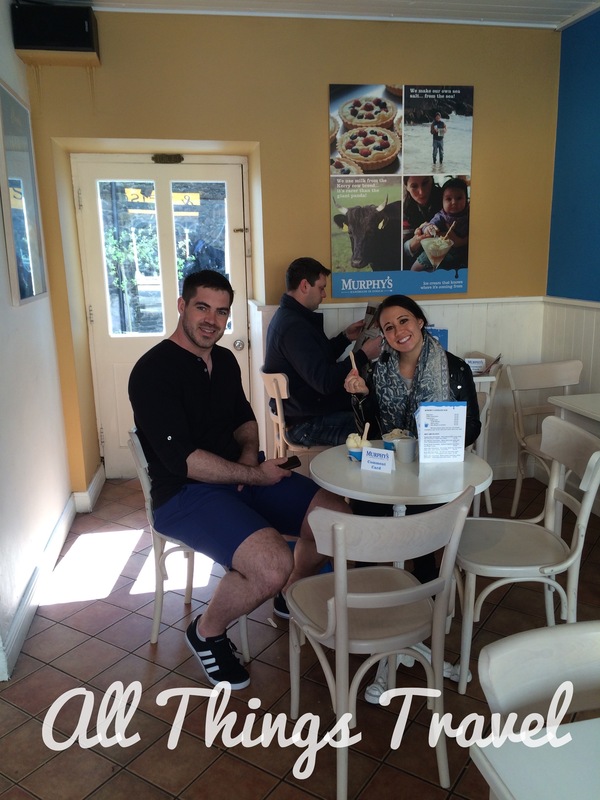 For me, their handmade ice cream scored a 10 on a five point scale. 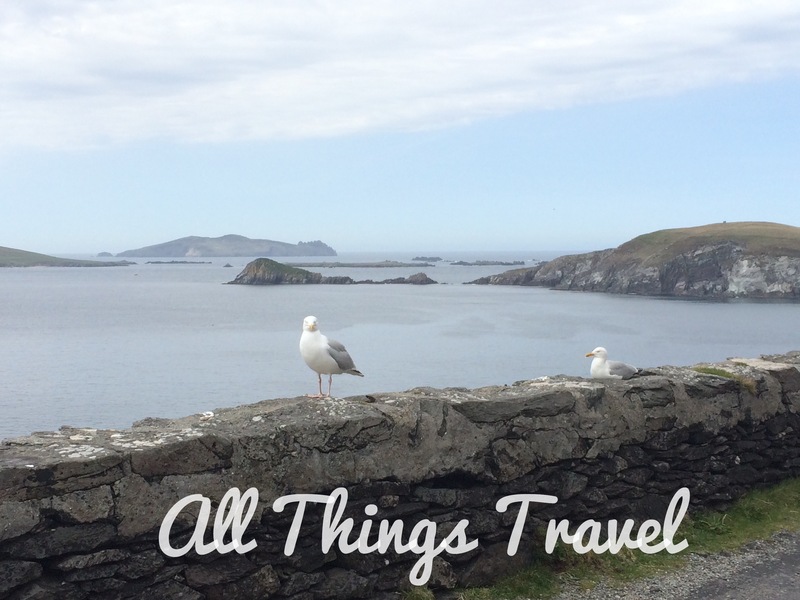 After our respite at Murphy’s we checked back at the Little Cheese Shop to find it still closed so we walked back to Heaton’s, retrieved the car, and headed out to Slea Head Drive, the clockwise tour around the Dingle Peninsula on the Wild Atlantic Way. 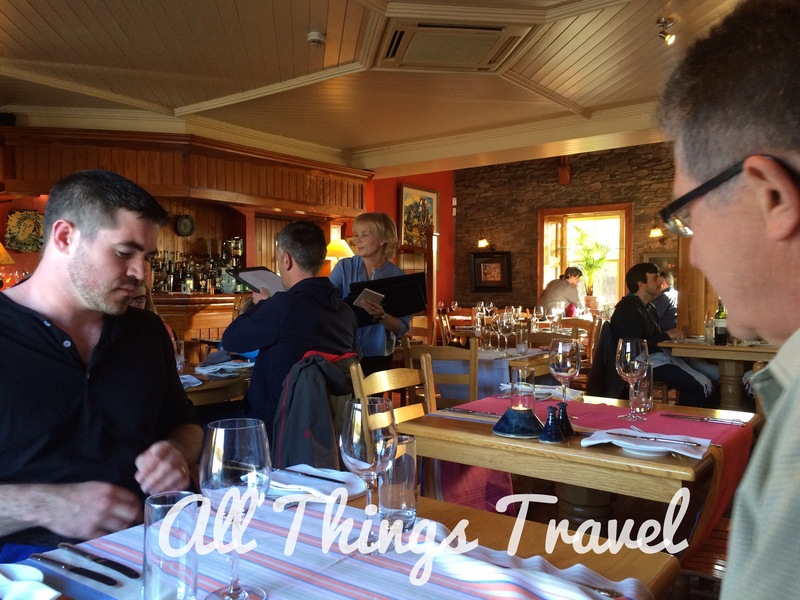 Rick Steves has a self guided tour in his Ireland book with stops and distances listed. If you use it, be sure to start at Oceanworld as all distances are measured from there. 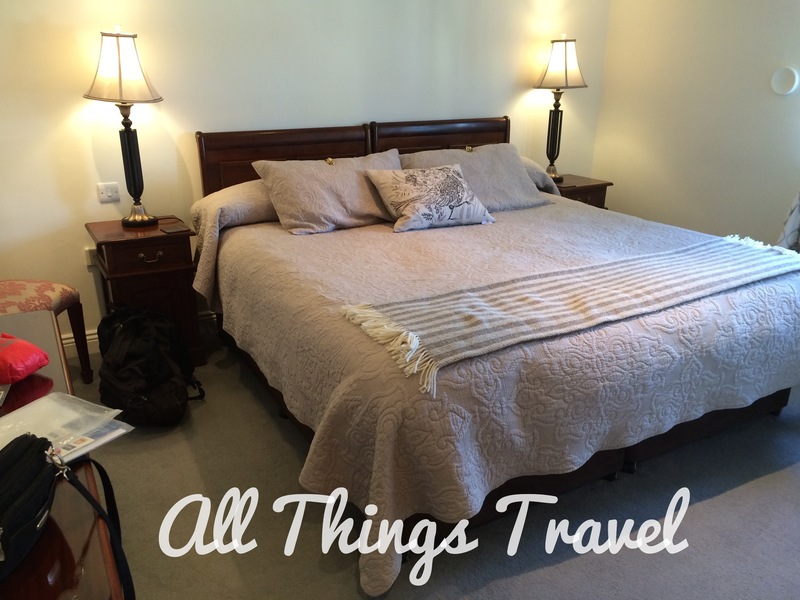 Because our B&B was beyond the starting point, we had some difficulties that we could have avoided. We stopped at many points around this loop but I’ll mention just a few. 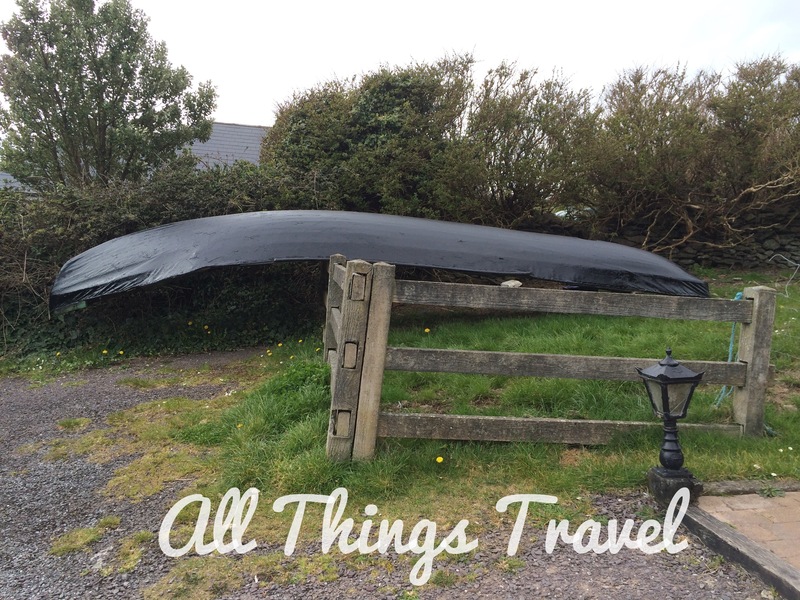 The first stop was to get a photo of a currach which is a traditional Irish fishing boat made from a wood frame covered in animal hides or canvas and “painted” with tar. They are lightweight and maneuverable but somewhat fragile (Steves, 2014). 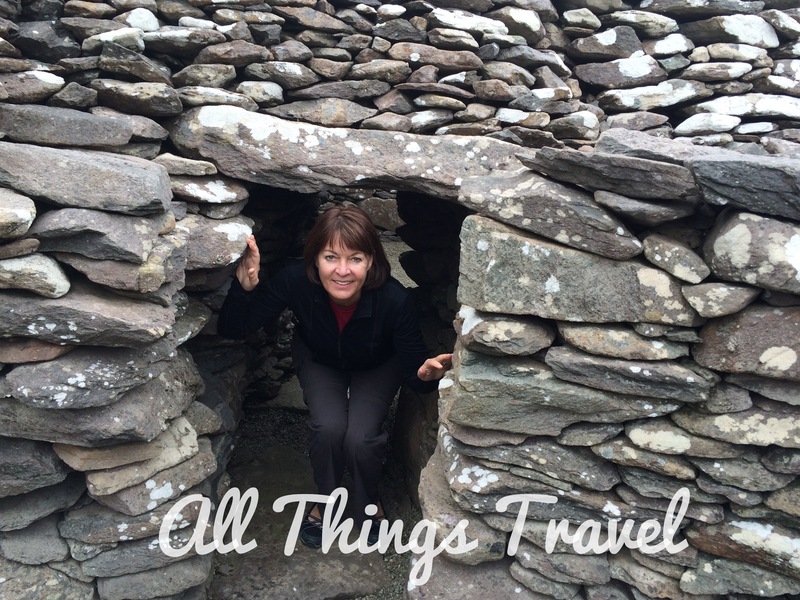 We explored an archeological site of beehive huts or clochans overseen by an elderly woman named Mary who collects the couple of euros for admission to this national monument. 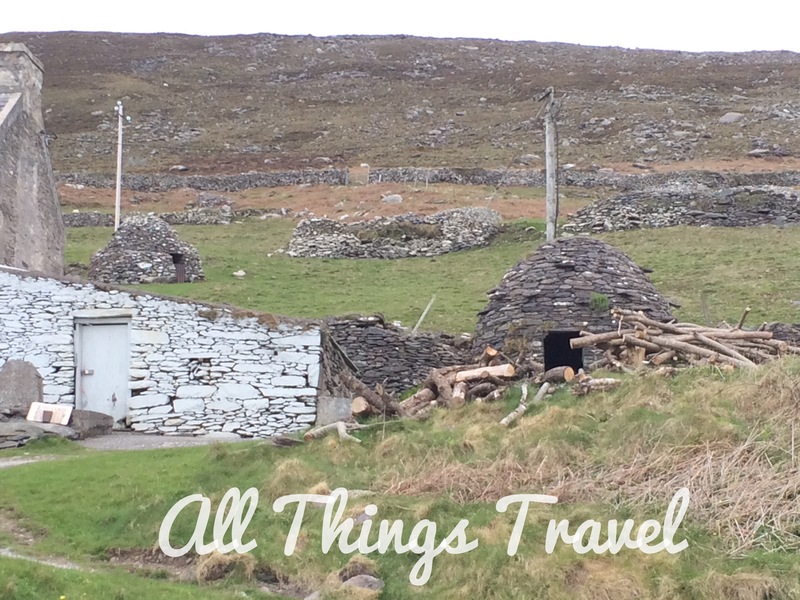 Beehive huts were constructed by stacking the stones without use of mortar in a form called corbelling. There is little known about the people who inhabited these abodes or, indeed, when they built the beehive huts, but it is generally agreed they are really old. We stopped at various lookout areas along the loop to enjoy spectacular views and try to capture some of the beauty digitally. 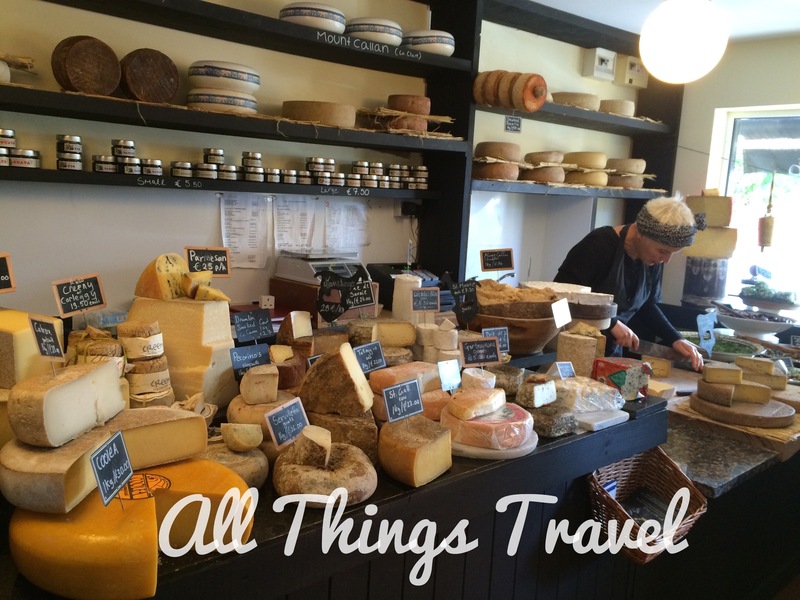 Back to the town of Dingle, we made one more attempt at the Little Cheese Shop. It was finally open but proved a disappointment. 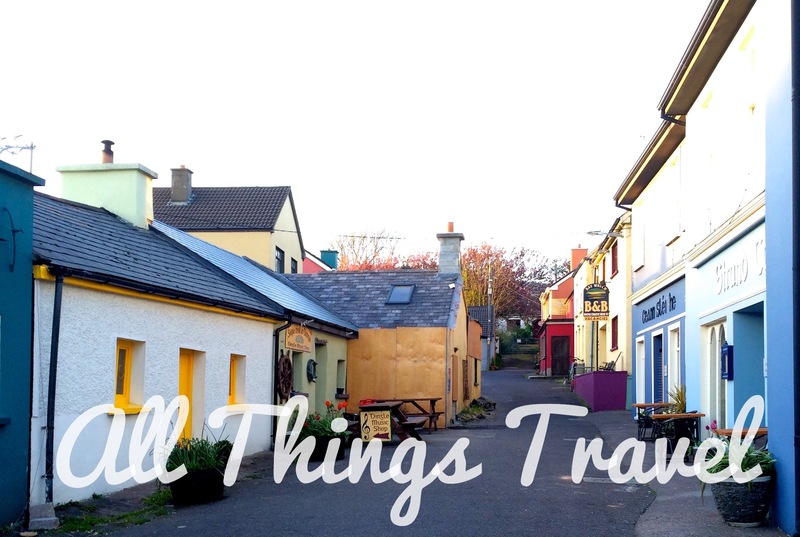 The owner was the least friendly person we met in all of Ireland but in fairness, her accent was definitely not Irish so she’s no reflection on the warm and friendly locals. 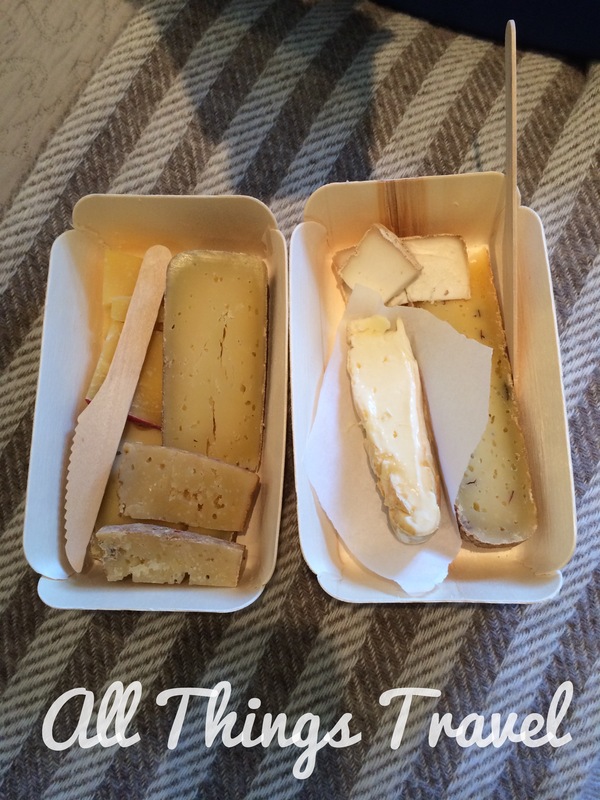 Samples weren’t freely provided although she did offer one to prove we wouldn’t care for a very aged cheddar. We can’t help it; we’re Iowa nice so we bought a board of several cheeses anyway. As a former cheesehead from Wisconsin, however, I’ve tasted as good or better elsewhere. Armed with a bottle of wine purchased at a nearby shop to wash down the cheese before dinner, we headed back to Heaton’s Guest House where we were delighted with our accommodations. Our rooms and the common areas were welcoming and comfortable with a delicious chocolate cake offered for guests who didn’t mind spoiling their dinner. 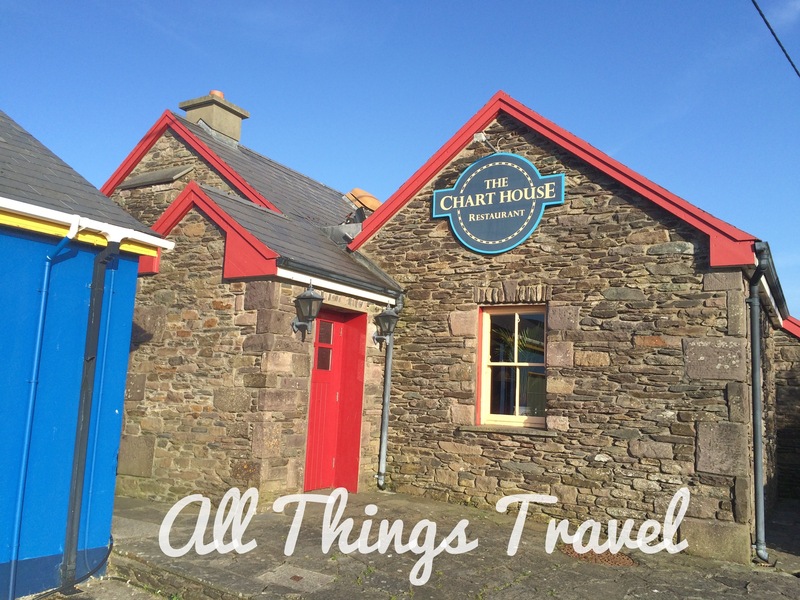 We decided on the Chart House for dinner in Dingle. 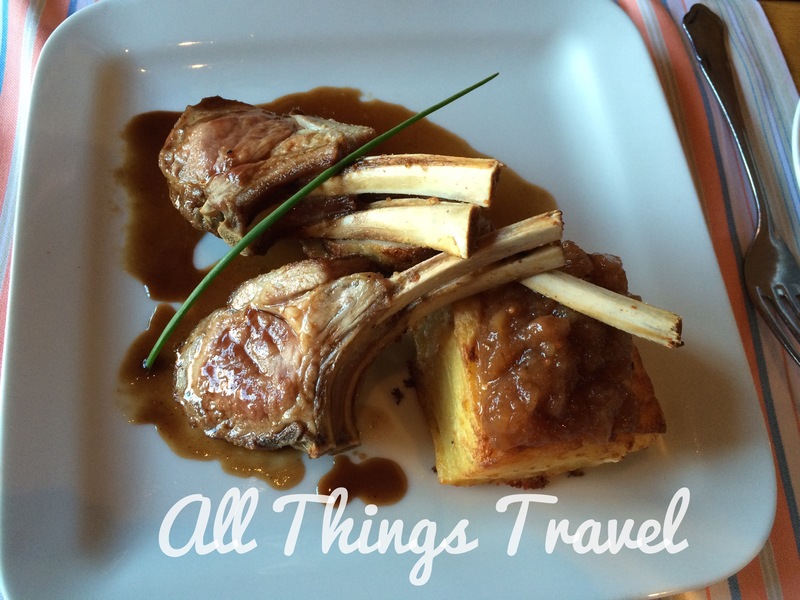 With plenty of awards and grand reviews to recommend it, we knew we’d find good food but we found a healthy dose of Irish charm in the atmosphere of the restaurant, too. 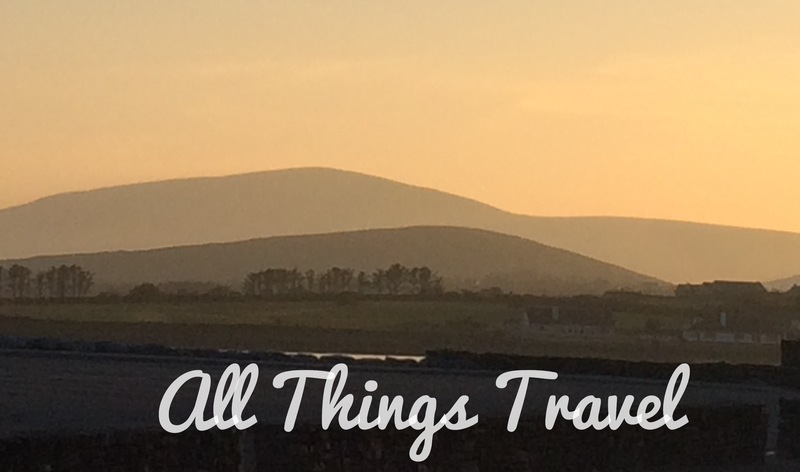 A walk following dinner allowed us some additional views and photos of darling, delightful Dingle with an amazing sunset. The following morning, one more surprise awaited us. 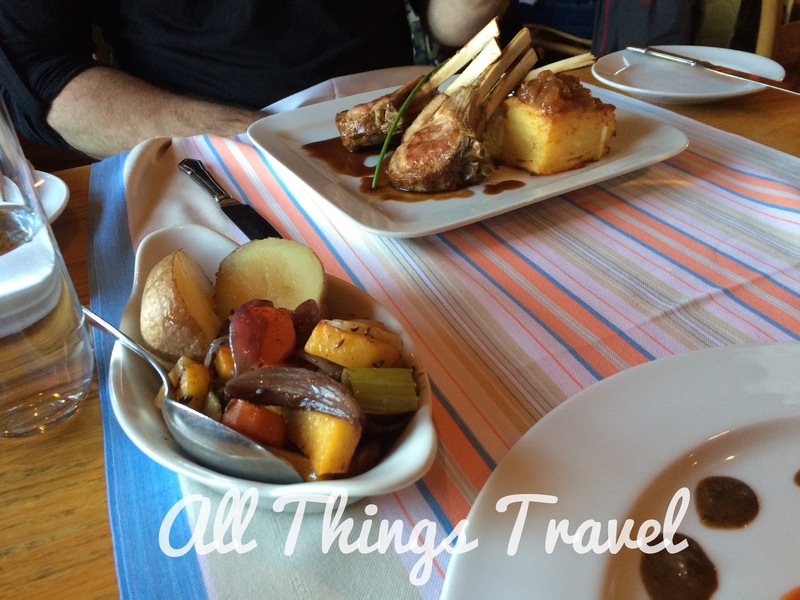 The breakfast at Heaton’s was gourmet and scrumptious, prepared by the owner, David Heaton, who happens to be a chef. 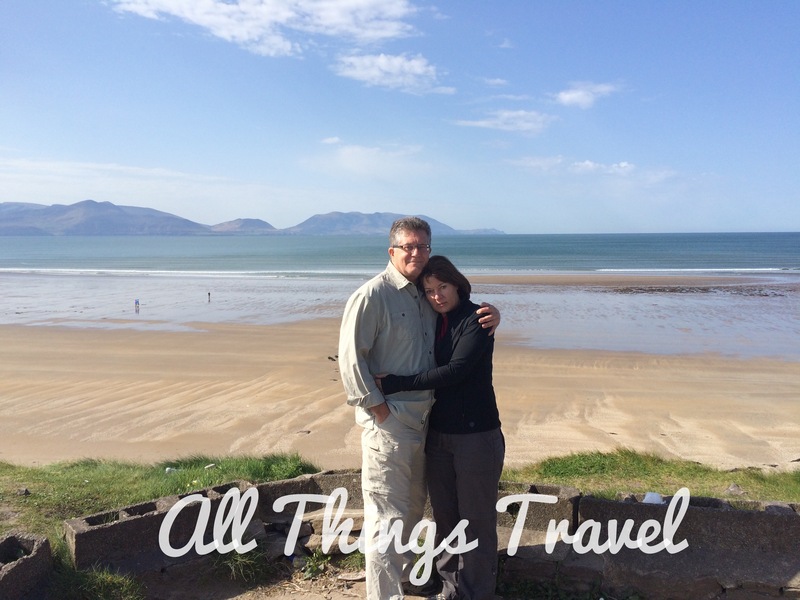 It was hard to leave such a special, beautiful, delightful place but we had many more sights yet to see in Ireland but, without a doubt, I plan to return. Steves, R. & O’Connor, P. (2014). 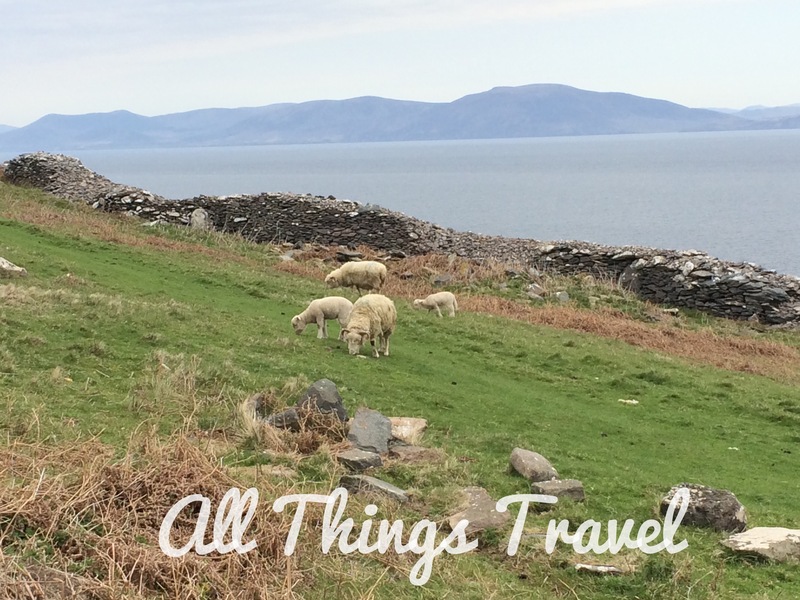 Rick Steves’ Ireland. Thanks, Donna. Next up is the Cliffs of Moher which I’m sure you’re going to LOVE! Sorry meant to say great views, sounds like a lovely place. Would love to follow the Ryan’s Daughter trail too.